'Anachronism Uninterrupted' by Dr. De Que - DPC Prints! My daughter is a recently graduated law student, a recently admitted-to-the-Bar attorney, and recently the CEO of a company she formed to practice Law. She asked me to shoot headshot portraits for her website, for social networks (e.g. Linked-In, Facebook) and such. After explaining I haven’t shot professional portraits before, and promising to do my best, I agreed to shoot her headshot. Next, I looked at a bunch of law firms’ websites trying to see how attorneys portrayed themselves. Then I scanned a bunch of stock photo sites looking for photos of lawyers and business people. I downloaded a bunch of photos, made a contact sheet and gave it to my daughter to see what she liked. Next we needed a site with great “lawyerly” backgrounds. 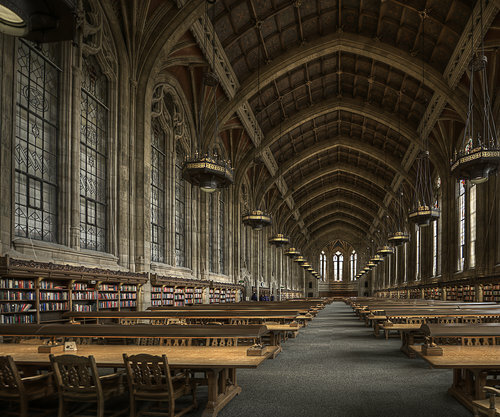 The University of Washington Suzzallo Library came to mind. Being this is Thanksgiving Day weekend in the US, we thought the place would be deserted on Saturday afternoon. The short ride is: 1) It was in fact deserted; 2) We got a bunch of terrific headshot candidate photos; and 3) We weren’t hassled or arrested in the process. As a side trip, I took a few photos of the library itself … which you see in this free study challenge entry. This photograph originally appeared in the Free Study 2010-11 Challenge.